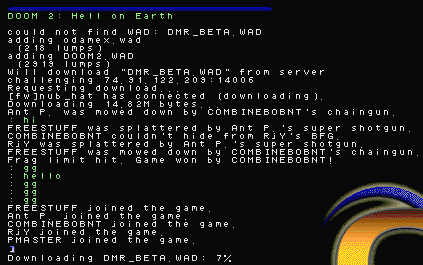 It looks like when a client connected to the server to download a WAD file, the client was never sent the full game update, which contains the current scores and the userinfo for every other client (their player id, their name, etc). The downloading client refuses to print chat messages if it's from an unknown player id. However, the downloading client would receive userinfo for clients that connect at a later time. r4989 fixes this bug. Please test and confirm.